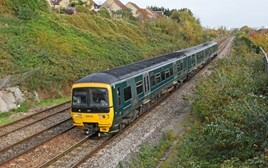 Class 166 Turbos were introduced on longer trains in the Bristol area on October 25, as Great Western Railway increases capacity. Trains between Bristol Parkway and Weston-super-Mare now use the three-car diesel multiple units, replacing Class 150s. This provides 80% more seats per day between the stations, according to GWR. The ‘166s’ also have air-conditioning, WiFi and universally accessible toilets. GWR says each ‘166’ has 118 more seats per train than the ‘150’ it replaces, forming part of a plan for a 52% capacity increase in the region. More ‘166s’ are expected to be introduced in the region soon, running between Cardiff Central and Taunton. Since the Class 166's have been transferred from the Thames Valley duties because of Class 387's have replaced them with Class 387's soon to extend to Reading, Didcot Parkway, Newbury and hopefully Oxford once the electrification to Oxford and Newbury is completed that will allow the Class 387's to operate between London Paddington and Oxford and between London Paddington and Newbury. With the Class 165's that will operate on the branch lines such as Slough-Windsor & Eton Central, Maidenhead-Marlow and Twyford-Henley-on-Thames branch services which could also be replaced by Class 230's D-Trains to allow the Class 165's to be transferred to branch line routes in Cornwall. I hope they sort out the air conditioning, can't think of anything worse than travelling from Cardiff to Taunton on one, I long for their day they get replaced on th Reading to Gatwick Line. Final long-distance HST services for GWR planned for May 18.